Meet Sheila the Kitchen Witch. She flew all the way from Australia to guard my kitchen and bring me good luck - and was a lovely and unexpected gift from a friend who lives down under. 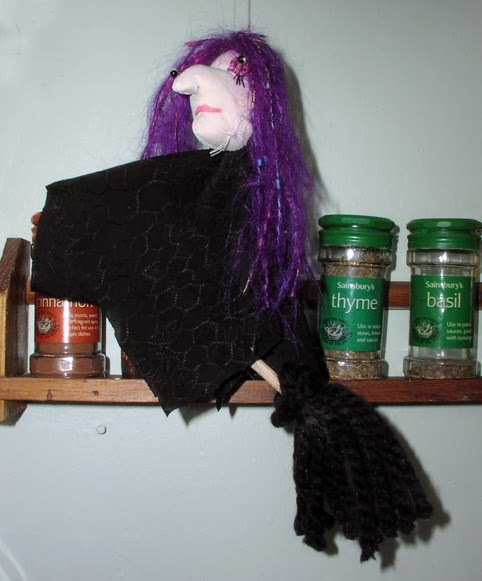 A kitchen witch - as well as being the kind of real-life witch who likes to brew up magic in the heart of her home - is the name given to a doll that looks like an old crone flying on a broomstick. These magical charms, or poppets, are supposed to bring good luck and ward off evil. The tradition comes from Northern Europe, although one intriguing hint that they may have at one time been an English folk custom too appears in the will of a John Crudgington, of Newton, Worfield, Shropshire, dated 1599. In it, he included among his household possessions "one witche in the kytchyn". Nowadays, you can find kitchen witches all over the world - including England and Australia, it seems. I am delighted with my little witch and have called her Sheila. She is guarding my spice rack and will hopefully help me improve my culinary skills - which could certainly do with a little magical help. She's cute. Well i know she sweeps the floors and with a smaller whisk broom can do the dishes, but can she cook? I am sure she can as witches make the best meals. LOL.